I can't keep up with everything that's going on with us on this blog, and I'm pretty sure most wouldn't want to hear absolutely. everything. that happens with us. Here are some highlights from the past week. Logan got his first haircut this past Thursday. I never understood prior to having a child how this could be an emotional event. And lest you think this is some bad foreshadowing, I wasn't emotional about it at all. I can kind of understand now that maybe someone would feel some sort of nostalgia for the original hair that grew from your baby's head - I mean I guess that's the reason? But no worries, we swept up some curls and they are safely in a small plastic bag sure to be put in some box that we will misplace for many years. This is what his mop looked like before. His hair had gotten very long but the only place you could really tell was in the bath when it was all wet. Since it's pretty curly, it wasn't a big issue, but now that it's gotten cooler and the humidity has dropped, it got pretty crazy. Sometimes it would hang in his eyes and he would insist on a ponytail. Which is weird for a little boy, but he loved it. If he saw a hairband around my wrist he would point at it and then try to gather his hair up. Marty would refer to is as his Samurai top knot. 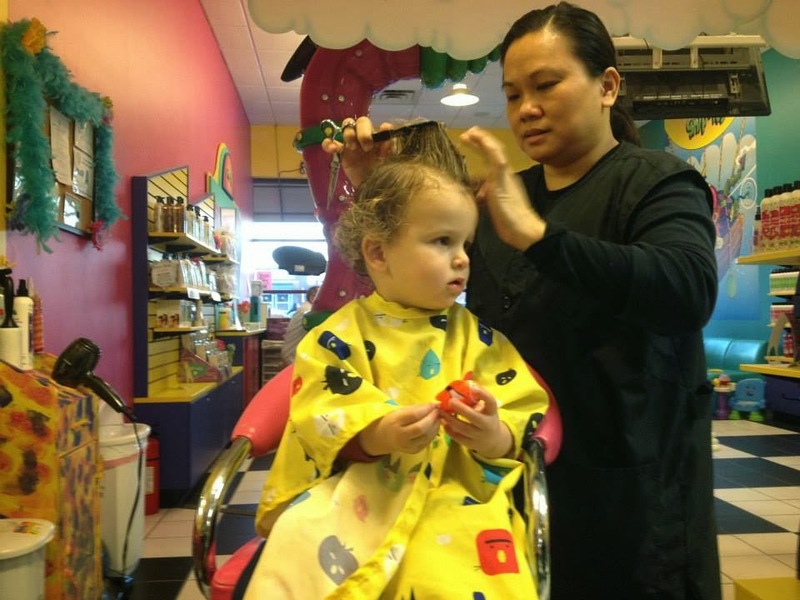 We took him to one of those kids haircut places which was very bright with lots of cartoons and big colorful characters around. I'm sure this is the seventh layer of hell to any hair stylist. Logan did surprisingly well once we plied him with animal cookies and little toys to hold. And here's his new look. We also had a great weekend. Saturday morning started off at OSB World Headquarters to jog over to Bond Park for a local 5K. Marty pushed Logan and we brought Tassie along, too. Marty wasn't going to run because a lot of the course is off road and rooty/hilly so not all that conducive to stroller running. Erik kept Marty company during the race (and got to see how strong Tassie is when she see's a squirrel. or duck. or insert anything). Doug, Daniel, Christina and I all did the 5K. It was fun - a toughish, wet course and for a great cause (proceeds benefited the MPS Society, and lots of kids with the disease were out there to cheer us on). You gotta love small local races - one little boy who was in a track start at the line with about a minute to go, turned to his dad with wide eyes and said, "Wait! You mean we're running 3 MILES??!!" Junior Awesome stood guard at the start. There were other people in the race. I swear. Post race pre breakfast gorge. That night was our annual OSB party. We had it at an Irish bar this year and as always, lots of fun was had and lots of beer was drunk. Not as much beer as last year, though, I think we set a record in 2012 (and many probably wanted to forget the day after and were on better behavior this time around). The next morning (after Logan slept into 8:00am - can I get a "AMEN!") we did a family bike ride at the American Tobacco Trail, with Marty pulling Logan in the Chariot trailer behind his mountain bike. We need to get one for Tassie, too, so she can join in the fun.